MWC 2017 is a veritable treasure trove of phones and while the likes of the LG G6, Huawei P10, Sony Xperia XZ Premium and new Nokia 3310 may have stolen the limelight, there are plenty more mobiles worthy of a shout out in Barcelona this year. We’ve scoured the booths from Hall 1 to Hall 8 at MWC 2017 to seek out the smartphones which were buried by the flurry of news from the more established brands at the show. So here are seven phones you may have missed at MWC 2017. The Gionee A1 was launched alongside its bigger brother the A1 Plus (below), and packs a 5.5-inch 1080p display, MediaTek Helio P10 chipset, 4GB of RAM, 64GB of storage, 16MP selfie camera, 13MP rear camera and a sizable 4,010mAh battery. Priced at €349 (around $370, £300, AU$480) the A1 is set to go on sale in India and Nepal first, with a wider rollout in the following months. As it stands it doesn't look like the A1 will make it to the UK, US or Australia but it's a firm to keep an eye on. The Gionee A1 Plus is a whopper, measuring 166.4 x 83.3 x 9.1mm and boasting a 6-inch 1080p display. Its full metal body provides a premium look and feel, while under the hood you'll find a MediaTek Helio P25 chipset, 4GB of RAM, 64GB of internal storage and a large 4,550mAh battery. Round the back you'll find a dual camera setup (13MP + 5MP), while on the front a 20MP snapper means you'll have some of the best selfies around. Priced at €499 (around $520, £430, AU$690), the A1 Plus has the same rollout plans as the smaller A1 above. Turkish firm General Mobile introduced its latest Android One device at MWC 2017 in the GM 6 - its fourth generation handset. The GM 6 lines up with a 5-inch HD display, quad-core MediaTek chipset, 13MP rear camera, 8MP front camera, fingerprint scanner, 3GB of RAM, 32GB of internal storage and a 3,000mAh battery. General Mobile aims to launch the phone in 45 countries, although it doesn't look like the UK, US or Australia will see the phone. It also features 4.5G, providing theoretical data speeds of up to 150Mbps and it will be available in three colors - Space Grey, Gold and Rose Gold. 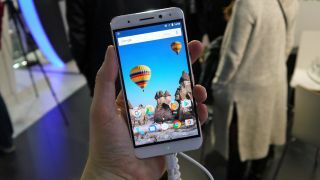 The GM 5 Plus wasn't launched at MWC 2017, but General Mobile's third generation Android One device was also on stand in Barcelona, showing that Google's affordable smartphone program isn't dead. Here you get a 5.5-inch full HD display, Snapdragon 617 chipset, 3GB of RAM, 32GB of storage, 13MP rear camera, 13MP front camera and a 3,100mAh battery. Its solid build and metal frame make this low cost handset feel strong and dependable. The HiSense A2 is a funny old phone. From the front it has a perfectly normal 5.5-inch full HD display, but flip it over and you'll find a second, e-ink display - the same sort that you'd find on a Kindle. It's been a while since we saw this dual screen fusion - anyone remember the Yotaphone 2? - but HiSense clearly believes it can make a better go at it than the failed Russian firm. There's also 4GB of RAM, 64GB of internal storage, a 16MP rear camera and a fingerprint sensor on the A2. There's no word yet on release date or price, but it will be interesting to see if it prompts any other manufacturers into a similar offering. Another up-and-coming smartphone manufacturer is Nubia, and its latest handset the N1 Lite arrived in Barcelona to dazzle the crowds. The stylish design and compact form factor makes the new Nubia a rather attractive handset. It features a 5.5-inch HD display, 2GB of RAM, 16GB of internal storage, 8MP rear camera, 5MP front snapper, rear mounted fingerprint scanner and a 3,000mAh battery. For now the Nubia N1 Lite will be available in Germany, Spain, Italy, Czech Republic, India, Thailand, Vietnam and Indonesia. The Nuu X5 is a handset made for frequent flyers. It comes with a pre-installed (and non-removable) eSIM allowing you to easily access local networks in foreign countries without having to roam with your home carrier. It’s controlled by an app on the phone, and you can purchase allowances on a pay-as-go, day-by-day basis, allowing you to only pay for what you need. The phone itself is solid, if a little uninspired. It features a 5.5-inch full HD display, 1.5GHz octa-core processor, 3GB of RAM, 32GB of internal space, a microSD slot, 13MP rear camera, 5MP front snapper, fingerprint scanner and a 2,950mAh battery. Priced at around £199 (roughly $240, AU$320) the Nuu X5 is due to launch in Q2 this year.